Canon EOS 1D Mark II vs Nikon D2Hs - bargain pro SLR DEATHMATCH! Nikon D2Hs vs Canon EOS 1D Mark II: 8fps bargain professional SLR DEATHMATCH! 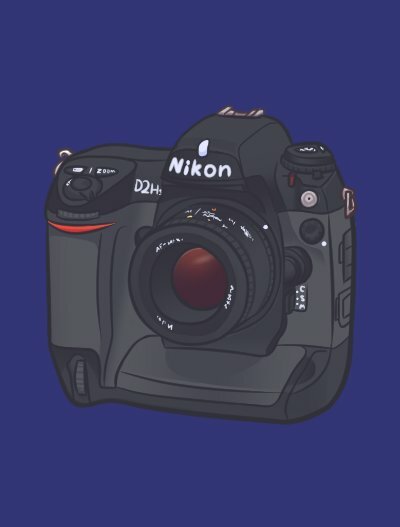 Left: Nikon D2Hs (artwork by Ayla Arthur, who you can support on Patreon). 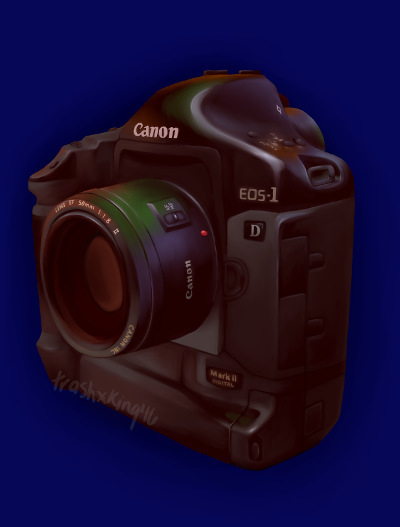 Right: Canon EOS 1D Mark II (artwork by Tyberius Anderson). My regular readers will know that I'm a fan of old, professional cameras that used to be unaffordable for normal people and are now ridiculously cheap. So when an ancient professional Canon EOS 1D Mark II digital SLR, in well-used but fully-operational condition, showed up on eBay for £250 in 2016, how could I resist the chance to shoot it and the Nikon D2Hs, another ancient professional workhorse, head to head? So here they are! The Canon EOS 1D Mark II and the Nikon D2Hs. Both are extremely tough cameras made in the early-to-mid 2000s that run at about 8 frames per second. Both cameras sell for around £200 to £250 well-used. 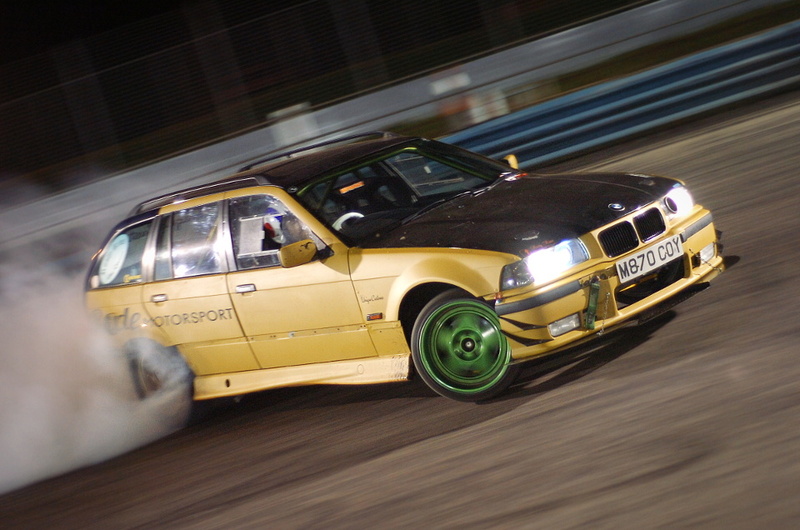 Both are several generations out of date, and have technical image quality vastly worse than any camera made today - but in the hands of one loudmouth with a website who likes photographing drift racing, how do they fare in 2017? 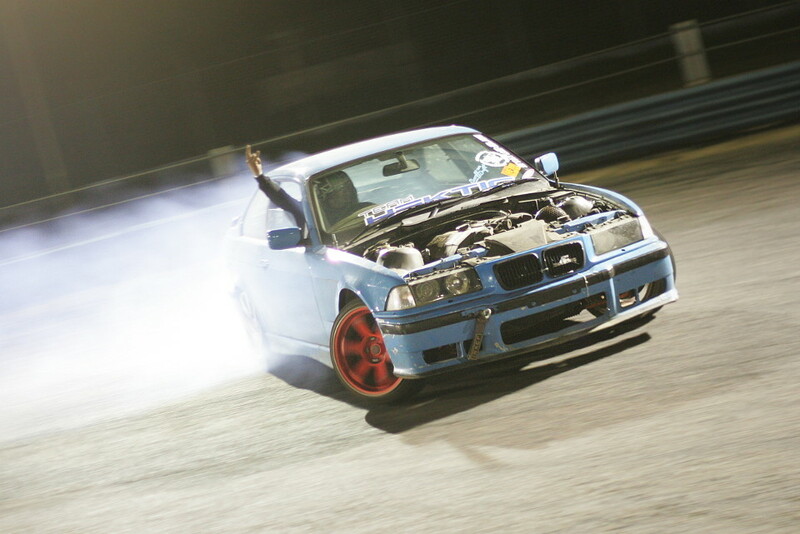 Medi Naderzadeh, NADT Run The Wall at Swaffham Raceway. 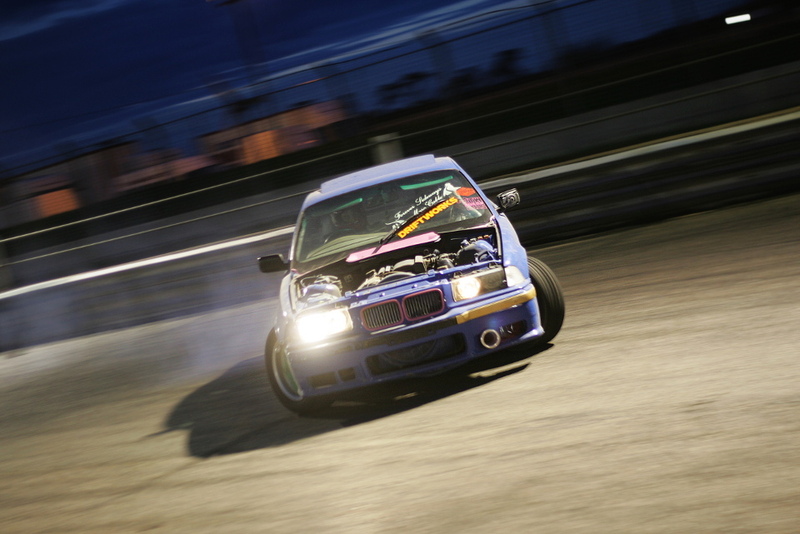 Shot with a Canon EOS 1D Mark II and EF 50mm f/1.8 wide-open, 1/100 at ISO 1000. There's very little difference between the two - providing you have a fast-focusing lens on the D2Hs. Canon makes very few slow-focusing lenses, and Nikon has made plenty in their history (particularly some of their older screw-driven AF telephotos). The 1D has many more autofocus points, but it has less flexibility for automatic autofocus point selection. Changing autofocus points is done with a press of the big, squishy, glove-friendly button on the back of the D2Hs, whereas the Canon requires holding a button while turning the control dial. I find it easier to switch autofocus points on the D2Hs. I call it a draw - the minor advantages of one over the other are insignificant and cancel each other out. Neither camera is going to let you down in real-world shooting. 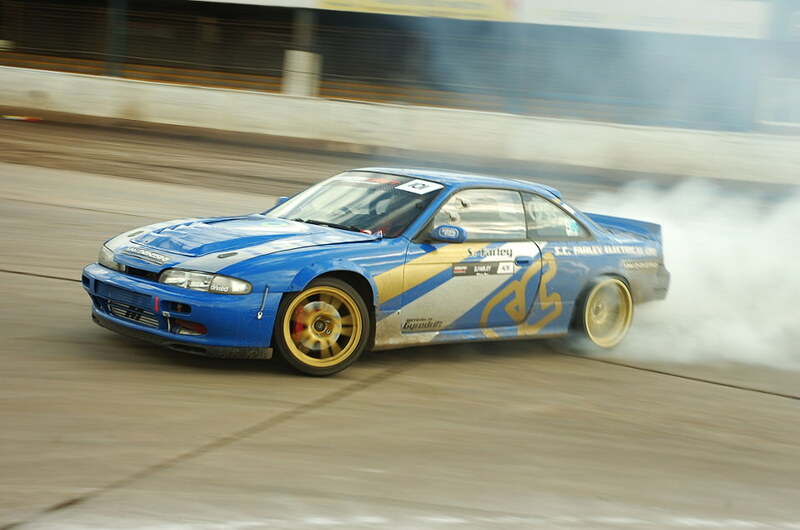 Stu Farley with the Norfolk Arena Drift Team, shot with a Nikon D2Hs, Nikon 18-70mm DX at 35mm and f/9, 1/100 at ISO 200. There's nothing to choose between these cameras. Both are made of metal. Both are weather- and dust-sealed, and both are designed to take the worst abuse from people who use them as tools, not treasures. I could nit-pick and say that the card door latch on the 1D feels a lot more robust than the latch on that of the D2Hs. 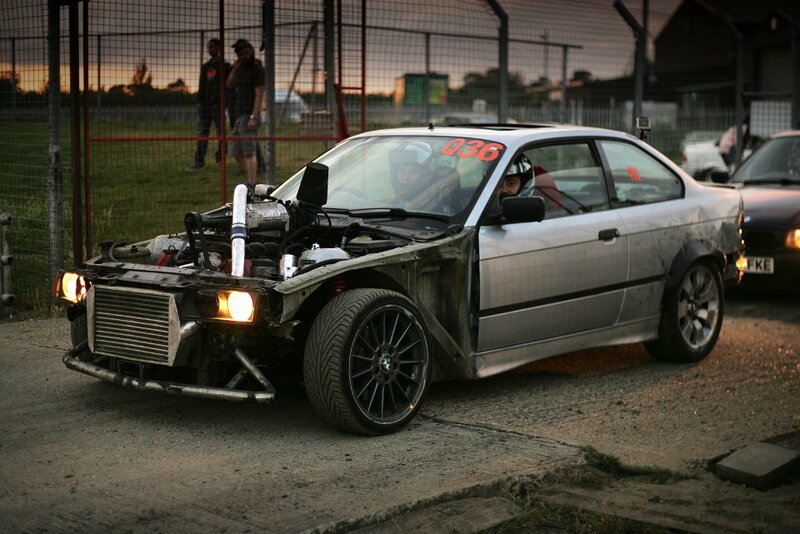 Dean Quinton, NADT Run The Wall at Swaffham Raceway. Shot with a Canon EOS 1D Mark II and EF 50mm f/1.8 at f/2, 1/80 at ISO 160. The 1D has no automatic ISO. This is something with which one can cope for shooting stills, and it's tolerable for nearly any kind of outdoor sports shooting, but for shooting things under floodlights it could be a deal-breaker. 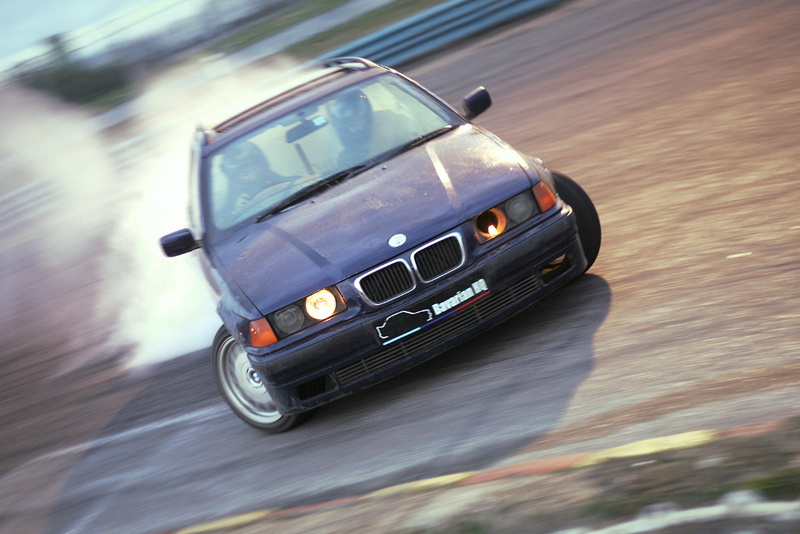 At Swaffham Raceway with a 50mm f/1.4, I can go from ISO 400 to 1600 and back a couple of times by panning a car on the corner! The 1D seems less easily confused by very bright subjects - the D2Hs tends towards massive underexposure if it sees a white car in bright sun, or headlights in dim light. The 1D works seems to cope with tricky lighting much more gracefully. I call it a win for the D2Hs; while the 1D's evaluative metering may be slightly better, auto ISO is quite important to me. This shot of Philip Hayden was actually shot with a Nikon D2X, but I like it so much I'm throwing it in here anyway and hoping nobody notices. Nikon AF 28-80mm at 62mm and f/9.5, 1/100 at ISO 100. I must issue a disclaimer that I run neither of these cameras on genuine batteries. I cannot dismiss the idea that any differences I am seeing are a consequence of my cheapskatery (this is, by my ex-cathedra declaration, now a word). On the other hand, if you had one of these you will probably be running it on aftermarket batteries too, because even if you could get new ones from the manufacturers, who would spend a third of the value of the camera on one battery when you can buy half a dozen aftermarket cheapies for the same price? With that proviso, both cameras go a long way on a charge - much more than any consumer-grade SLR camera, and vastly more than any non-SLR digital camera. The longest time for which a 1D battery has tolerated me was about 2,000 on a charge, whereas the D2Hs will do more than that with a part-charged, worn-out battery. The D2Hs wins here, for getting more shots with a smaller battery - but only heavy shooters will notice. 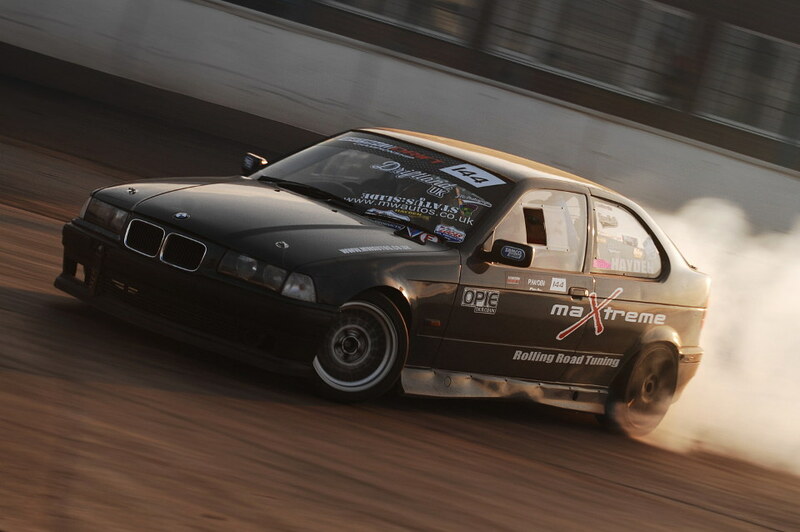 Ryan Dixon, NADT Run The Wall at Swaffham Raceway. Shot with a Canon EOS 1D Mark II and EF 50mm f/1.8 wide-open, 1/80 at ISO 320. I'm biased by years of shooting Nikon SLRs, so of course anything that isn't a Nikon doesn't work as well for me. Professionals who shot Canon cameras back in the mid-to-late 2000s will have their Canon controls in muscle memory, just as I can find every control on the D2Hs with my eyes closed, and after a few months of shooting you will too. Really, for most people starting from scratch with SLRs, you'll probably find these about equal. If you've come from anything that is not a professional grade SLR, you will love having physical buttons for everything. With my biases stated, I am convinced that the Nikon is vastly better. The 1D has fewer dedicated buttons; the three on the top right of the camera control control six different things, most of them important, by different combinations of button presses. The Nikon has dedicated buttons for all of these functions. I much prefer the Nikon's way of selecting between autofocus points, which is a big squishy 4-way button that moves you up, down, left and right between points. I dislike the 1D's menu system. Scrolling through menu items requires that you hold the 'SELECT' button while turning the rear control dial. I've never been able to do a quick setting change. I find the exposure compensation button on the Canon to be too close to the control dial. The control dial has to be turned while holding the exposure compensation button, and my fingers feel as though I must convolute them to do this. This might as easily be attributed to my clumsy hands as it could be attributed to a real ergonomic flaw of the Canon. Both cameras are very fast! The Canon is rated to run half a frame per second faster than the D2Hs. It is only because I have shot a D2H or D2Hs for the last seven years, and thus know what 8 frames per second feels and sounds like, that I notice the 1D being very slightly faster. This will make no difference in your photographs. Not a drift car, Little Bytham, Lincolnshire. Shot with a Canon EOS 1D Mark II, Canon EF 50mm f/1.8 at f/4, 1/200 at ISO 100, raw file processed with Darktable on Linux. As said, both cameras have fantastic autofocus; use them correctly with the right lenses (like the very cheapest 50mm f/1.8 in both camera systems!) and you will always get perfectly sharp photos. No problem there. The D2Hs has a very strange colour rendition with which I have fallen in love, and that I don't see from more modern cameras. The 1D looks horrible with saturated colours as they head towards over-exposure. The 1D has almost exactly twice the number of pixels. This means about a 50% increase in linear resolution (the number of pixels that make up either the width or the height of the image), for about twice the file size. Nearly all my work goes on the Internet and most of it doesn't get printed big, so strange ol' Lewis actually prefers the smaller file sizes from the D2Hs. Chomping through the tiny files so quickly is incredibly fun on a modern SSD'd computer! If you shoot raw, there's no real difference other than the 1D's files being larger. With modern raw processing software it's easy to nudge the files from either cameras to look far nicer than the in-camera JPEGs. Both are about the same at high ISOs - I can't discern much of a difference either way without setting up experiments, and test shots are as boring to take as they are to look at. Dave 'Kiwi' Jackson, Swaffham Raceway. Nikon D2Hs, Nikon 50mm f/1.8 AF-D wide-open, 1/80 at ISO 640, extra noise caused by post-processing. This isn't about what lenses you can get; of course the best and most expensive Nikon lenses are every bit as great as the best Canon lenses and vice-versa. If you're buying one of these cameras, though, it's either because you are a cheapskate or you share my sense of humour. In either case, what we really care about is the availability of good, cheap lenses. For this, the D2Hs wins. The 1D only works with full-frame Canon lenses; EF-S lenses designed for smaller 1.6x sensors wiil not mount on it. But, the 1D also has a 1.3 crop factor, so at the wide end, to get the same field of view on the 1D as you would on a 35mm, you need lenses with more exotic and complicated optics. There are no dedicated lenses for the 1.3x crop factor. Nikon, on the other hand, has been making lenses designed for their smaller-sensored cameras for over a decade. There are lots of superb and very cheap lenses in the Nikon system; the very cheapest 18-55mm kit lens is an outstanding performer, and the £100 55-200mm VR that often comes as part of a bundle with Nikon's cheapest cameras is sharper than some of Nikon's professional f/2.8 telephotos. As an example. if you want a 28mm-equivalent field of view on the D2Hs, you can buy the aforementioned 18-55mm kit lens for £50 or less, or the older 18-70mm DX for a tiny bit more if you require super-fast autofocus. For the 1D you'll need a 20mm f/2.8 for six times the price, and the Canon system has nothing that will let the 1D cover the whole range of the 18-55mm. Justinas Norkus awaits his turn. 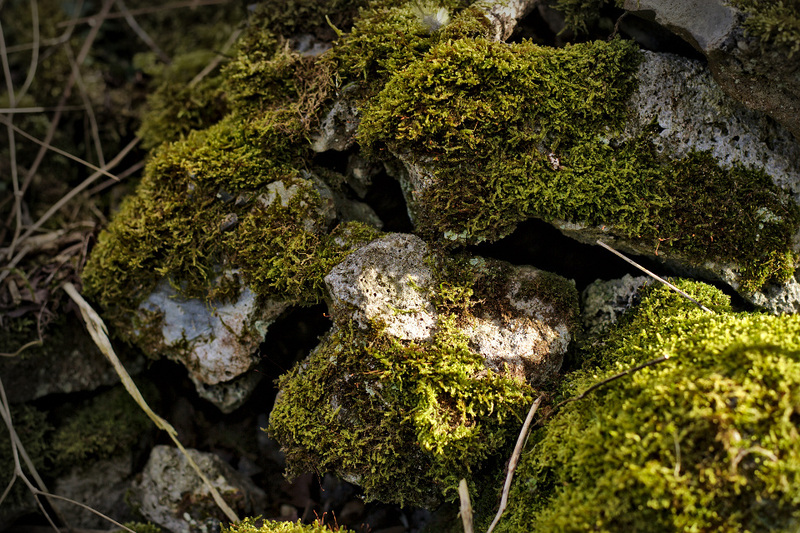 Shot with a Canon EOS 1D Mark II, EF 50mm f/1.8 wide-open, 1/80 at ISO 160. This is a big win for the 1D! The 1D has two card slots, one SD and one CompactFlash. The D2Hs takes a single CF card. The 1D can write to both cards as you shoot, which means instant free backups. 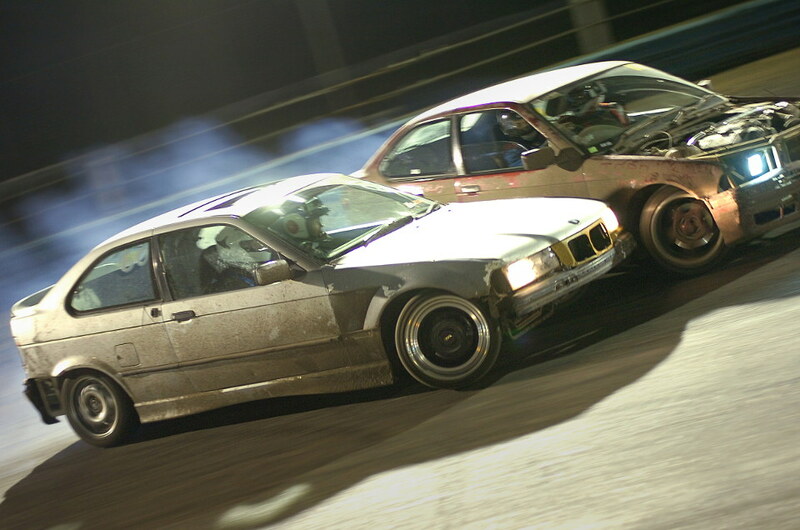 Josh Payne chases Joao Matos, Swaffham Raceway. Shot with a Nikon D2Hs, Nikon 50mm f/1.8 AF-D wide-open, 1/80 at ISO 560 (noise caused by pushing about a stop of exposure from the original). Over a decade after they were introduced, both of these cameras still hold their own for serious amateur action photography, and especially for folks who shoot raw. If you already have Canon full-frame lenses for the 1D Mark II, the 1D wins. If you already have lenses that will fit the D2Hs, the D2Hs wins. If you don't have any kind of other investment in either system, the cameras are about equal. I find the Canon's ergonomics worse, the Nikon D2Hs has a colour rendition that I adore, and I find the Nikon's auto ISO quite important, but two of those things are purely subjective and one is a feature that you might not care about for your work.